What’s the Best Piano to Buy for a Beginner? A piano is a joy to play and gives even the humblest room a touch of sophistication and elegance. A well-kept piano can last for as long as 60 years, but well before it’s played its last note there are two questions a potential owner might ask: What’s the best piano for a beginner, and how do I take care of the piano once it’s bought? 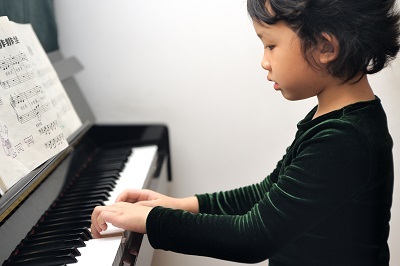 First, the very best type of piano for a beginner is an acoustic piano, specifically an acoustic upright, which costs much less than a baby grand. An acoustic is still pricey and can run from $4,000 to $8,000, but there’s nothing better to develop the skills and even the strength needed for a beginner to learn to play the piano well. An acoustic is made of real wood and has real strings, and its sound is unsurpassed. Digital pianos and electronic keyboards can be bought, but their sound is not nearly as rich or lovely. A digital piano can come close, but an electric keyboard doesn’t. An electronic keyboard is for a person who already knows how to play the piano. Since a piano is so expensive, it is best to buy one like you would buy a car, whether new or used. Don’t buy the first one that catches the eye. Take into account the room where the piano will stand. Is the floor carpeted or hard? How high is the ceiling, and what is the ceiling made of? Is it in a high traffic area? Though people may enjoy the idea of family and friends gathering around the piano for sing-alongs, the piano ideally shouldn’t be put in an area where there’s a lot of traffic or where people would be tempted to rest plates of food or glasses on it.